Oct. 12, 2012. 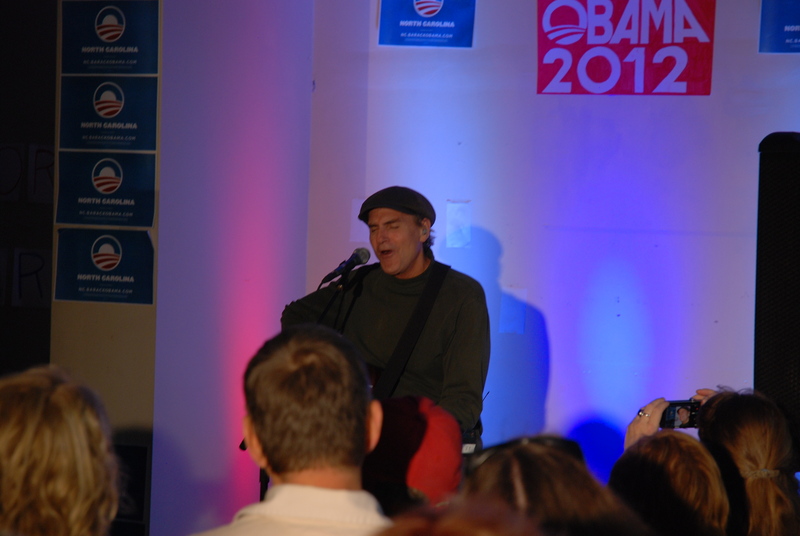 On Friday, Oct. 12, the Boone Obama For America re-election campaign headquarters in downtown Boone hosted five-time Grammy winner James Taylor for a private invite-only performance to thank all the campaign volunteers. Prior to the performance, Taylor toured SOS Printing and the High Country Press offices, both of which share the same building the Boone Obama for America headquarters is located in. Taylor widely praised President Obama, calling him an “intelligent, compassionate leader,” and also criticized the Republican party. “I think this idea of trickle-down economics that the Republicans portray as job creation — I think that’s just the worst kind of shenanigans,” Taylor said. Following his opening remarks, Taylor played about a 30-minute set to a visibly delighted crowd. Taylor has been touring extensively to support President Obama’s re-election campaign. He will be performing at Westglow Resort and Spa in Blowing Rock at 7 p.m. this evening. Ticket prices for the performance range from $500 for students and “youth” (under 30) to $1,000 for anyone aged 30 and up. For tickets to attend the performance and a private dinner afterward with Taylor, the price is $2,500. For more information about the performance later this evening at Westglow, call 828-295-5146. Do not call the Westglow front desk for event information or tickets.